Another great one Christina! I love the Glimmer Mist on the branch. I never think of stuff like that. Such a cute little bird, I have never used him, but now I will. That's my favorite card on wild card, I use it all the time. That card would be perfect with the saying "a little bird told me...."
I think I'm gonna do that, thanks for the inspiration!! Great video! You are so cute to watch. Love the video and the idea of doing all the cards on WC! thanks! Great video! LOVE IT! 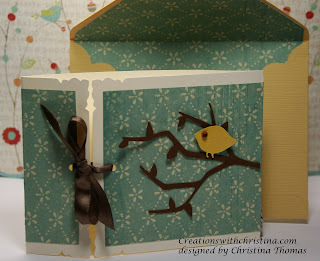 I really love the paper choices you used and that bird on the branch is TOO DARN CUTE! I'm behind watching your videos so I am off to see more of your fabulousness! Christina, I haven't watched your vidoes yet on the Wild Card series, but I have the cartridge and I will watch every one. I love your cards. I hope you don't run out steam before you get to # 46. Have fun creating your cards. 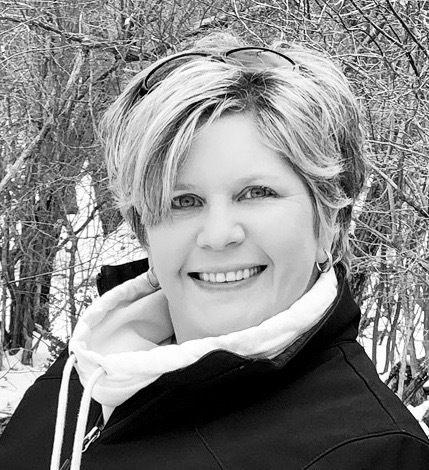 Great video, Christina....I'm so excited about you doing videos on the entire Wild Card cart...thanks so much for all that you do! Another Wonderful video Christina ... This card is totally adorable ... I'm looking forward to what you do with the rest of the cards on the WC cart ... this should be fun! Thanx for the inspiration. This is wonderful! So glad you are going to make all the cards from WC. Thank you!! Glad you will be making all of the cards. Darling card. I just bought this cart so I'll be watching with keen interest. I love that you are going to make all the cards on Wild Card - I have the cartridge but have so under used it - I also love this particular card - very feminine. Cute birdy! I really love your blog and I'm so excited that you will be making all of the cards from Wild Card. I will enjoy seeing your creative talent applied to this amazing card (which happens to be one of my favorite cartridges.) It is going to be exciting to watch you tackle this project! So glad I found you videos on Wild Card. It's a fun cartridge. Can't wait to see what you do with all 50. Thanks for doing this. Christina - thank you so much for doing all these videos. I just found your blog. I can't wait to getting cutting with Wild Card. Thanks again. Discovered your blog this week via the Cricut.com message board. Your Wild Card videos are my motivation / reward today as I work on my taxes... i.e. do one section then watch a video, etc!!! THANKS!! I noticed when you used the glimmer mist and then picked up the tree branch how pretty the paper looked with the white shadow of the branch. You could do a card with just the design left behind once you used the mist and then dabbed away the excess. Just a thought.